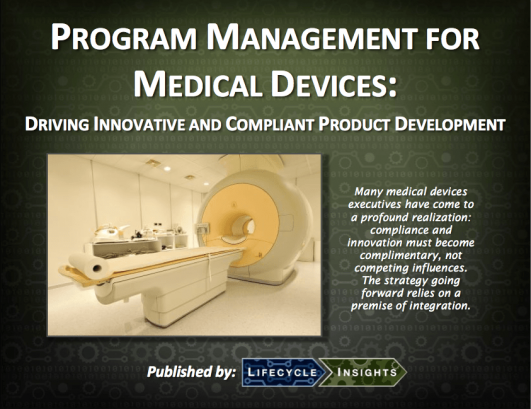 This eBook outlines the technology needs of Program Management for Medical Devices. It also compares and contrasts potential technology solutions. Product Lifecycle Management (PLM), What are Enterprise Business Platforms, Solutions and Apps? Developing products in the Medical Devices industry is no easy task. There’s incredible pressure to innovate by incorporating new technologies into longstanding products to provide better care and services. Yet, that effort to innovate is often constrained by requirements to conform to regulations and document the entire development process. Program Managers are often caught in the middle, trying to find the right balancing act between innovation and compliance. This eBook looks at traditional and progressive approaches to program managing such new product development efforts as well as different IT systems. This eBook is of most value to Program Managers in companies serving the Medical Device industry. It is particularly useful for those that are mandated to meet demands for innovation as well as compliance. By and large, the objectives were clear: innovate consistently and rapidly but ensure compliance with regulations. As a result, many companies have setup teams to achieve these two goals. R&D teams must drive innovation efforts in the development process. Regulatory and quality teams must track, manage and enforce compliance to regulations during the development process. Each have developed and employed targeted processes. Each have planned and deployed specialized Information Technology (IT) systems. This has resulted in a traditional environment where teams, processes and IT systems are separately tracking these objectives. For Program Managers, this traditional environment has presented significant challenges. Tasked with keeping innovative development processes on schedule and compliant to regulations, they are forced to cobble together a comprehensive view with information from separate IT systems. Given the breakneck pace of development, such views quickly become out of date, rendering attempts at compliance ineffective.